What's that? Did I hear someone wanted find & replace implemented? Edit: The update has been accepted to the archives! --text boxes can be used just as easily as the editor, includes special characters, deletion, etc and [enter] characters are displayed here as the xbar symbol. --if Str6 was tampered with, and compression is off and the program has trouble starting, then the next time the program is run, it will turn compression back on and try to load the last save. I don't know if you saw my IRC message, but (using the data -> .8xs script I wrote) I added auto downloading to Txt2Note in my PR. All you really have to do is enter the escape sequences for the bytes of each character that is in the "dictionary" that isn't in the lookupTable look up table already (I added some of the tokens myself). You can find the bytes on TIBD. Yes, it is because I could not fit the entire word in that horizontal space. What might you suggest instead? Ok, awesome! I accepted the PR but the site isn't quite operational yet. I will try to get it working here soon. Remember, if you find a bug, be sure to report it here! I am compiling a list and will likely miss some if you don't tell me. +I've recently fixed the find & replace routine. If your replacement string contains stuff that's in your find string, it no longer goes on an infinite loop. For example, want to put the letter "A" at the beginning of each new line in your note? You would need to replace "x̄" (x̄ pops up in the text box when you hit enter) with "x̄A". +I've also fixed a bug where the cursor doesn't show up in the right spot in the text box after using special characters. Other bug fixes and optimizations are coming soon in v1.1.1. Another update, v1.1.2 is out. This update fixes several bugs and has some minor graphical improvements. +The "OK" button in find&replace is green now when you are on it. However if either of your two text boxes are empty, the button will be red. Clicking it while red will simply take you back to the editor. +Fixed bug where string2note calculation algorithm couldn't handle two line breaks next to each other. In addition, you should know that .txt to Note is still on its way, I just need some more time. 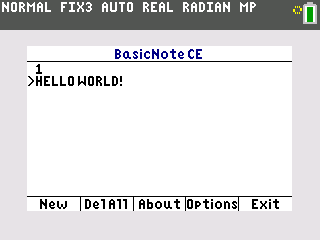 BasicNote has reached over 500 downloads! Thank you all for checking it out and be sure to leave a review if you like. The scroll bar overlaps the menu when the last line of a scrollable piece of text is deleted. Extra side note: when the first line of a file is empty, The name is an x̄ (not sure what I'de do about that though). Regardless, this is a great program, and I look forward to many future versions. Lol but yeah, that should be a really simple fix. As it is a rather complex program as a whole I'm not surprised I messed up on little things here and there. The program is designed to scan for the first actual text in the file. It displays the first line that has text as the title of the note. If it doesn't find any text, but there are the paragraph breaks as you're saying, the title defaults to x̄. Thank you! I don't know if I'll actually be making "many future versions" as I'm quite done with this project already. But I'll let you know. I found 3 related crashes (that's right, these are more than just graphical issues). 1 - Delete a few characters off of the end of line 1 (note that it does not correct the rap), then move the cursor to the start of the 2nd line and delete what appears to be the new line, this will cause ghost text to appear in place of the first line, editing the ghost text (or pressing right enough) will cause a crash. 3 - Delete the 2nd line entirely (you can delete text on the first line as well) and insert text on the first line. Please note that I was for the most part just spamming the keyboard and if any readable text is there, it is meaningless. Fix these bugs and I'll do my best to find more of them. © Copyright 2000-2019 Cemetech & Christopher Mitchell :: Page Execution Time: 0.166431 seconds.